For this couple who met in James Joyce‘s hometown of Dublin, a Celtic inspired design was the obvious choice for the proposal ring. We discussed her likes and dislikes with the proposer, and figured out that Silver would be a good choice – One of her favourite (Celtic) bracelets is made in oxidized silver and this ring is designed to grow darker with time. Since their story begins in Dublin, the detailing on the ring is inspired by Celtic design that can only be seen from the side of the ring. 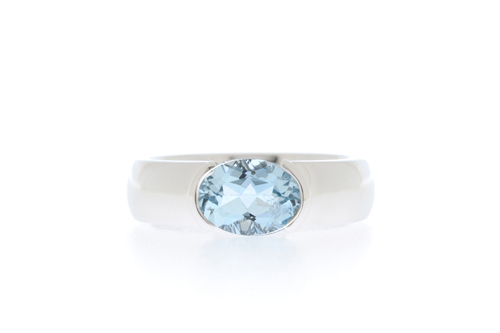 When wearing, it remains a clean and classic ring with focus being on the lovely ocean-coloured stone. I like this silver ring very much. Now a days women wear this type of ring as a fashion statement. 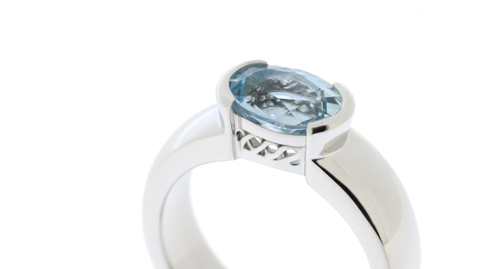 This ring has impeccable finishing and design! The Celtic Design looks classic and its kind of romantic if you own this precious thing. I love how it looks, it’s just so blue!